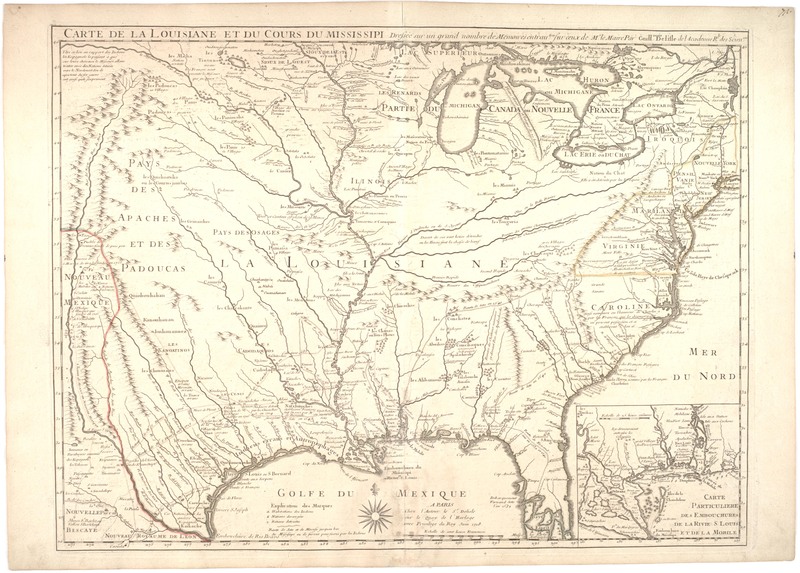 This map of “la Louisiane” was published by French geographer Guillaume de l’Isle. 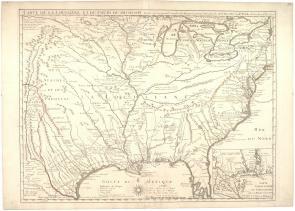 It is the first detailed map of the Gulf Coast region and the Mississippi River, as well as the first printed map to show Texas (identified as “Mission de los Teijas etablie en 1716”). The map is also the first to identify New Orleans, founded in 1718 (see the inset detail of the mouth of the St. Louis River). De l’Isle obtained most data from French explorers and fur-traders traveling through North America. A close examination of the map reveals the land routes of early explorers in North America. Each route is mapped out and identified with the explorer’s name and year of travel. The map represents the travels of Spanish explorer Hernando de Soto in Florida and the southeast in 1539–1542, Alonso de Leon in 1689, and French Canadian explorer Saint Denis in 1713 and 1716, among others. De l’Isle accurately identified the location of many Native American tribes, marked by a small hut symbol and a name. De l’Isle’s map provoked outrage among the English for extending French claim over British-controlled areas and reducing the size of the English coastal colonies. He further angered the British by stating on the map that Carolina was named after French King Charles IX, instead of after Charles I, King of England, and by identifying Charles Town (Charleston) as “nommé par les Francois,” although Charleston was actually named after Charles II of England. In recognition of his work in promoting France’s commercial interests, Louis XV named De l’Isle “Premier geographic du Roi.” Despite the availability of new information, the Carte de la Louisiane greatly influenced later maps of North America.